Have you ever travelled somewhere and found that it hurt to leave? Somewhere that you felt so completely at home that your nomadic nature calmed and you wanted to stay for a while. This happens extremely rarely for me, I am always ready to move on, until I discovered Helsinki. 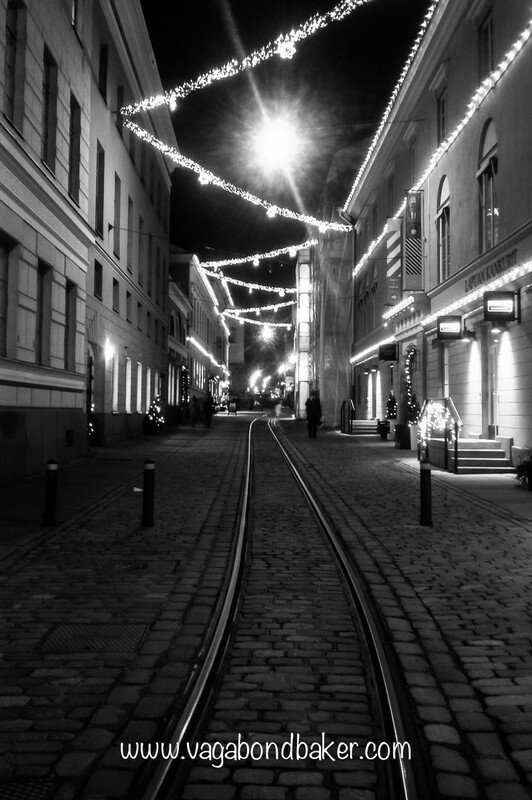 I’m not entirely sure why, all I know is that I have ached for Helsinki ever since I left. I can remember being stood on the earthen ramparts on Suomenlinna, the wind buffeting me: the glittering Baltic Sea spread out to my left and to my right Helsinki clung low to the coastline beyond the island. I realised I was beaming, I felt overwhelming happiness: I loved it here! I looked back across the sea and it dawned on me I would have to leave, I’d already booked my ferry ticket. 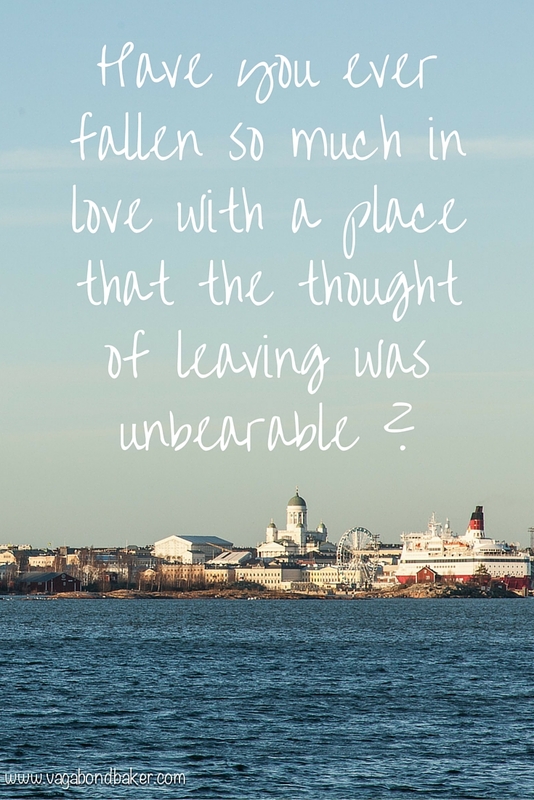 I’d not even been in Helsinki for a week yet the thought of leaving was unbearable. 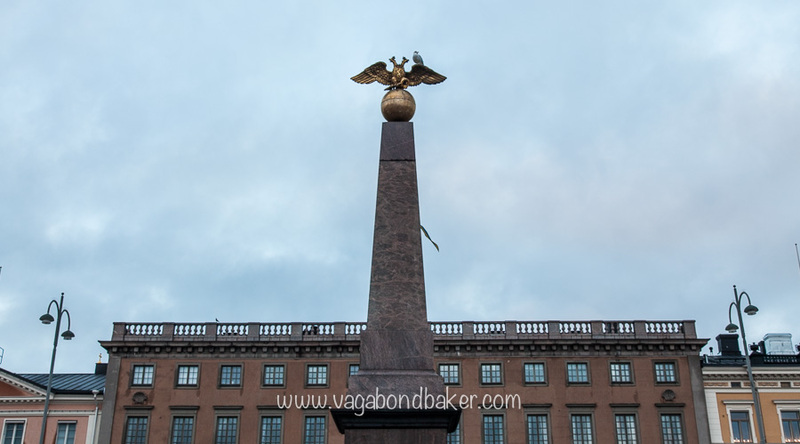 This post really should be about all the cool stuff you can see in Helsinki: the touristy spots and landmarks but I realised I didn’t see as much as I intended to; I spent my week simply enjoying Helsinki. If I was to sum up my Helsinki experience in three words it would be: walking, coffee, sauna. Now that sounds rather suitably Finnish to me! I’d been in Finland for a week before I arrived into Helsinki, by train from Tampere. I’d booked into the Eurohostel where I got a bed in a two bed dorm room. Interestingly, in a week staying in that room I had a different girl sleeping in the other bed every night: is no one staying in Helsinki? Just me? I thought I’d probably meet up with other travellers, there may not be that many people travelling around southern Finland at this time of year but surely there would be a few in the capital. There may have been, only they never stuck around long enough for me to meet them! All I could think was, they’re missing out! Their loss! I’d made myself quite at home, I even had a bit of a routine that involved coffee at a nearby coffee-house followed by wanderings into different corners of the city. 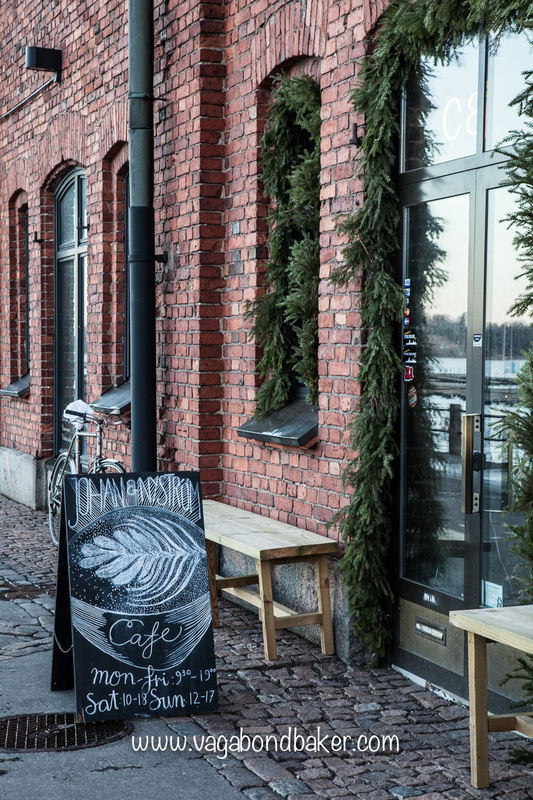 This coffee stop was the highlight of my day, now bear with me – this isn’t that there is nothing better to do in Helsinki, it’s simply that it’s a great way to experience Helsinki. And it suited me down to the ground. December in Finland is cold, as I’m sure you can imagine, I didn’t see snow in Helsinki but I did experience rain and an icy wind (as well as magnificent clear blue skies). Sitting in a cosy coffee shop with a steaming cup and a pulla is my main lasting impression of Finland. Heaven. What made it truly blissful though was the atmosphere. 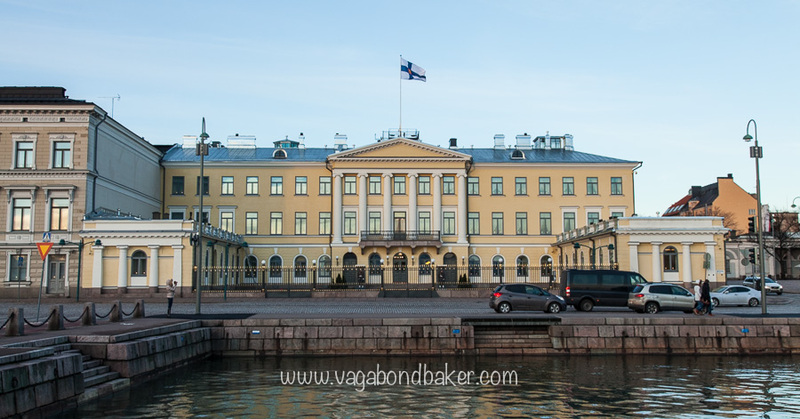 Until I got to Helsinki I’d considered the Finnish language to be a fascinating curiosity. I’d been ‘challenged’ to learn it and I’d had a few basic words when I arrived into Finland. I’d been spurred on to learn more throughout the first week, encouraged by my friend Satu who was impressed with what I already knew. Sitting in this busy cafe every day, the Finnish chatter flowed over me and I noticed how beautiful it actually sounded. The time I spent drinking coffee had given me an opportunity to appreciate it. I had subconsciously been enjoying hearing it, it was only when some girls sat near me one afternoon, and conversed in both English and Dutch, that I realised how beautiful and extraordinary Finnish is in comparison. 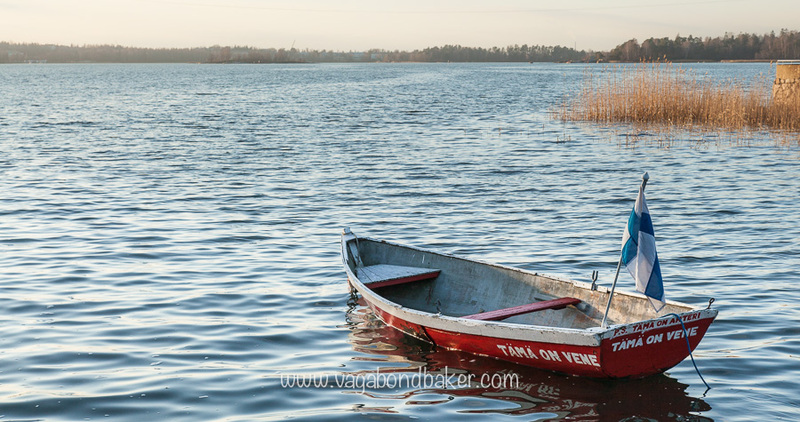 Tämä on vene: this is a boat! 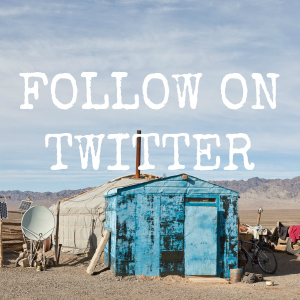 How wonderful to have a small enough grasp of a language that you can translate things! One of my daily wanderings took me to the delightful Regatta Cafe after a recommendation from Georgette who writes Girl in Florence blog. It was a fine walk to the north-west of the city, past the remarkable Rock Church (Temppeliaukion kirkko) to this tiny cafe on the water’s edge. Helsinki seems to be floating on the sea, it is surrounded by islands and you are never far from the water. The Regatta Cafe overlooks a typically serene watery view, you’d be forgiven for thinking you’d left the city miles behind (as you can see in the ‘Tämä on vene’ boat photo above, it was moored next to the cafe). This super cute cafe is very popular, I can imagine in the summer the seating outside is buzzing with chatter. On a cold December afternoon the outdoor tables were almost deserted but when I stepped into the cosy interior it was full of people, squeezed onto the tightly packed tables and benches. The counter at the back had a selection of food, it seemed only right to order a korvapuusti, I was already planning the recipe in my head so that I could bake them back home! It was such a gloriously sunny day I took my coffee and bun outside and joined the cheeky sparrows, they enjoyed the crumbs. One brave fellow hopped onto my table and looked at me inquisitively. I can’t resist an inquisitive sparrow! 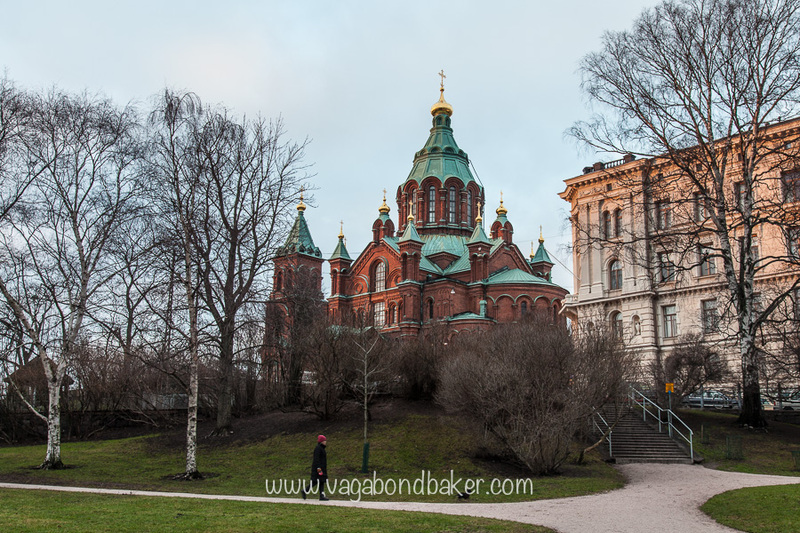 Every day my walk from the hostel on Katajanokka – an island near the Kauppatori (market square), where the ferries leave from – would take me through the Senaatintori (Senate Square) and past the magnificent Helsingin Tuomiokirkko (Helsinki Cathedral). 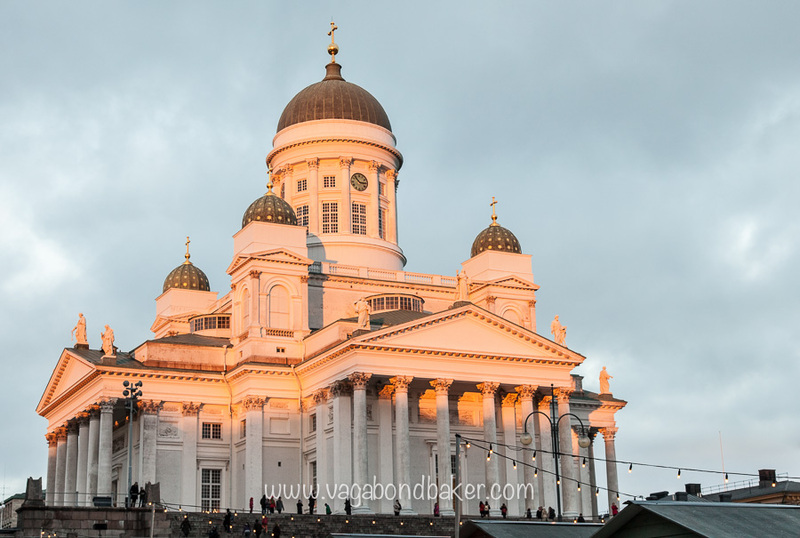 This stunning white church dominates the Helsinki skyline, it stands out even from the sea. Due to its exalted position it basked in the last golden rays of the setting winter sun, long after much of the city was already in shadow. The square was filled with a Christmas Market (joulutori if you’re enjoying the Finnish: have you worked out tori means square? 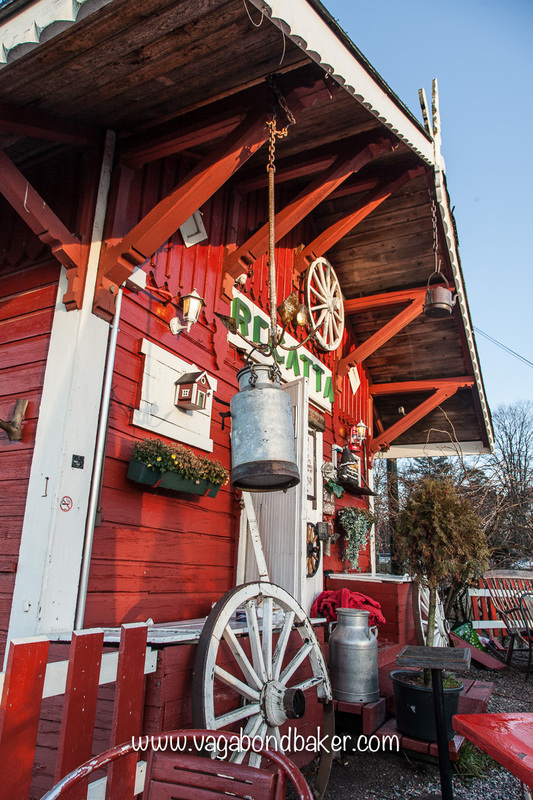 ), neat rows of wooden stalls strung together with fairy lights selling Finnish delicacies and crafts. Climbing the steps up to the cathedral gave great views over the little wooden roofs to the grand buildings beyond. Down by the water at the Kauppatori, small ferries leave regularly to the island fortress of Suomenlinna (I’ll write that up on a separate post, it deserves more than a couple of lines) and it’s a great place to visualise some Finnish history: a tall obelisk, topped with a two-headed eagle, known as the Stone of the Empress was erected to commemorate the visit of Empress Alexandra during the time when Finland was a Grand Duchy of Russia, it stands in the middle of the market square. You can watch Empress Alexandria talk about her obelisk on this short video, it explains a bit more about the history at that time. The Uspenski Orthodox Cathedral nearby also harks back to that era and looks distinctly Russian with its red brick construction and golden onion domes (Helsinki Cathedral was also built during Russian rule but in a neo-classical design). 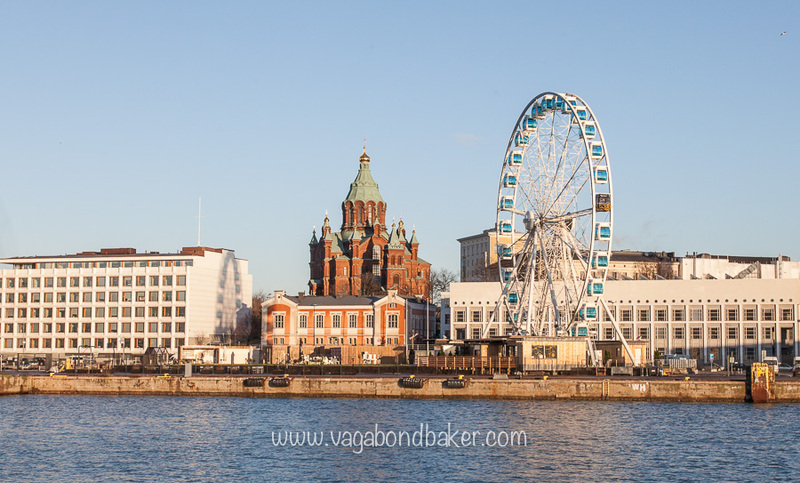 The waterside around the Kauppatori bewitched me, I often detoured to get an eyeful of it. The hostel was near to the ferry terminal for the ferries to Stockholm and Tallinn, these big ships seemed to dwarf the surrounding buildings. 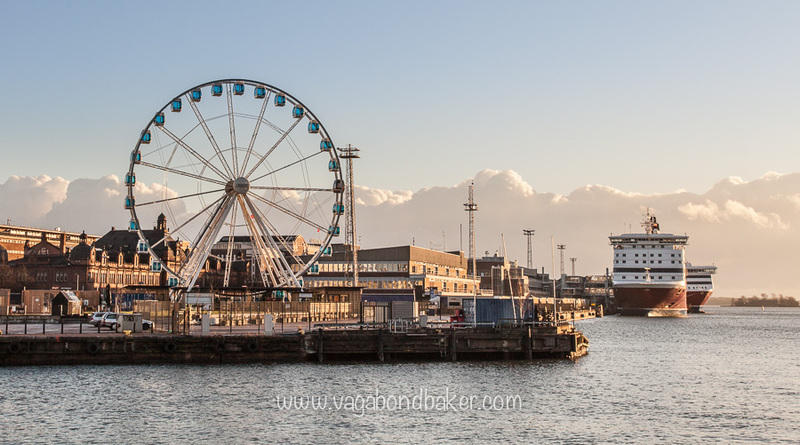 Taking the ferry to Suomenlinna gave me a better view of the waterfront and the FinnAir Sky Wheel, a large observation wheel that is about the only thing taller than the cruise ships: I bet the views from this are spectacular! The Uspenski Orthodox Cathedral dominates the skyline above Katajanokka, I loved the shadow of the FinnAir Skywheel on the adjacent building. 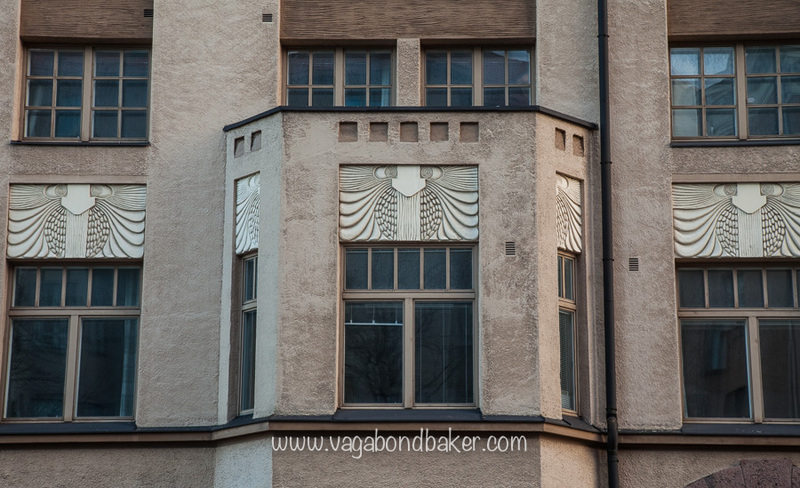 I loved walking around ‘my’ neighbourhood on Katajanokka, it has a mixture of low industrial buildings and wonderful late Art Nouveau Jugendstil residential buildings. It was a treat to spot the marvellous art nouveau details like curvy, unusual owls and pretty swans. I’d live here if I could, most definitely: yes, I felt very at home in Katajanokka. Instead I was in a dorm in the Eurohostel, but what a great location. 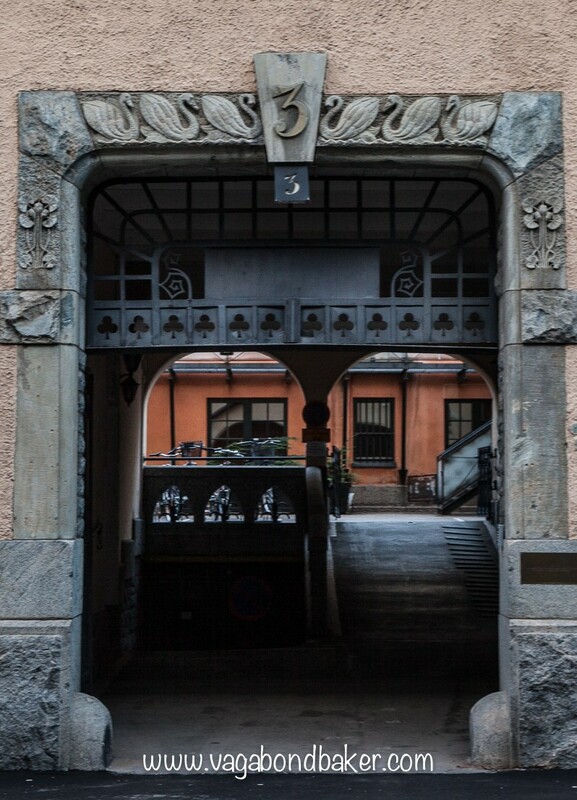 Lovely detailing on the residential buildings in Katajanokka. Can I live here please? Another architectural pleasure for me is the railway station, this superb building is one of the finest examples of late art nouveau architecture anywhere and those four handsome stone men guarding the entrance bring the grand granite station to life. 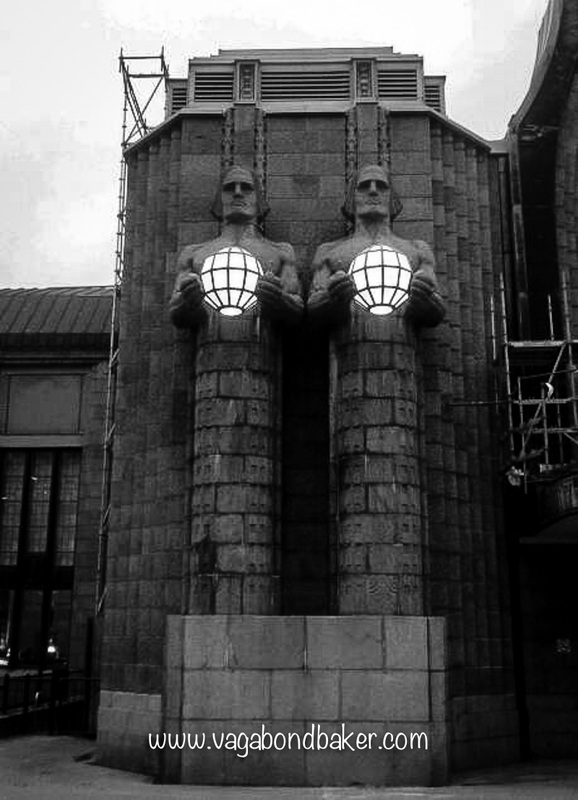 I personally think you can almost see the transition from art nouveau to art deco in this station with its bold lines and angular stone men. Unfortunately, there was quite a lot of scaffolding over the soaring main arch but I managed to snap a nice photograph of the side entrance showing the lovely copper-topped clock tower. I spent a morning walking around the brilliant design district, window-shopping and admiring the creativity and style Helsinki has on offer. I have no photos (other than some unblog-worthy phone ones) and I wanted to spend a day without lugging my big camera around – I swear it gets heavier every year. The design district is a great idea and it really promotes individual creativity and businesses: in a mass-produced world, this makes a refreshing change. You can explore the area using a design district map and there are guided tours too. There are shops and galleries showcasing everything from jewellery and fashion to art and home wears. During my week in Helsinki I left the city twice, a ferry ride out to Suomenlinna and a day trip to the pretty little town of Porvoo. The rest of the time I explored the city on foot and sheltered from the elements in warm, inviting cafes. The Eurohostel has an awesome sauna that is free to use in the early mornings, I never rose early enough to catch the morning slot but I made full use of it in the evenings! I had a Hostelling International card, that I’d acquired the previous December in China, and this gave me half-price access to the evening sauna. I looked forward to the evenings as much as I did my morning coffee shop ritual! 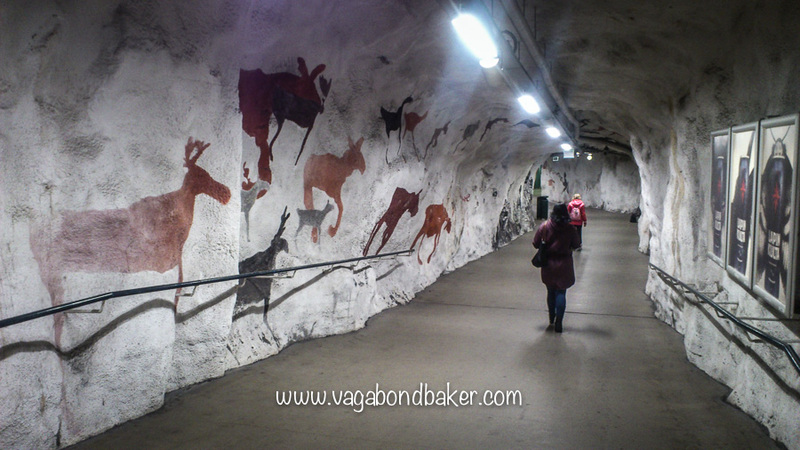 The day that I left Helsinki it revealed another surprise: I took the metro from Kaisaniemi Helsingin Yliopisto Metro Station and discovered the foot tunnel was designed like a cave and it is adorned with reproduction stone age cave paintings of Finnish animals. Oh Helsinki! 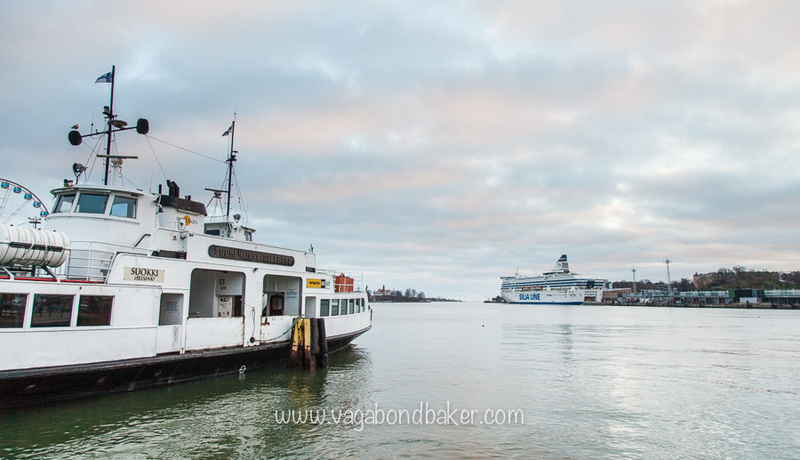 I departed this wonderful city by boat, on a Finnlines ferry to Germany five days before Christmas. 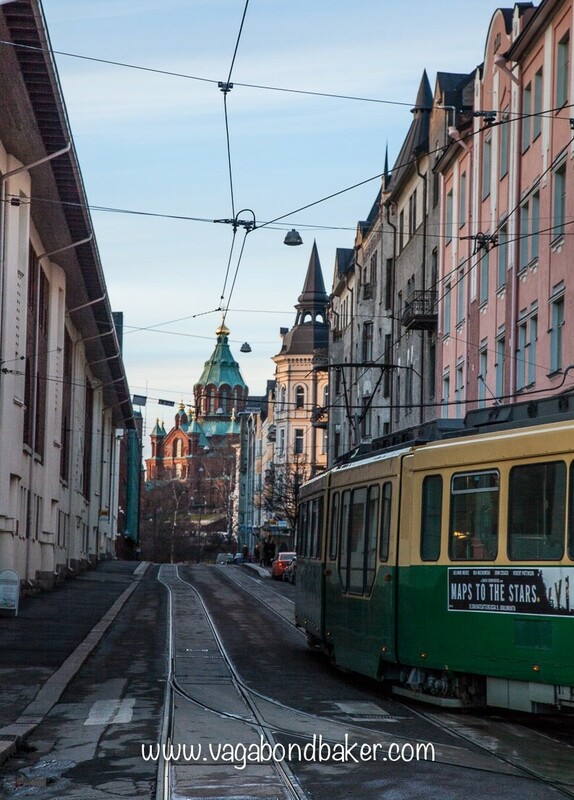 I was not ready to leave – not Helsinki, not Finland– there was so much more I wanted to see, wanted to experience, wished to eat. Looking out from the Kauppatori to the island fortress of Suomenlinna. I’ve kept up with my finnish, I am going to learn this beautiful language. I will return. 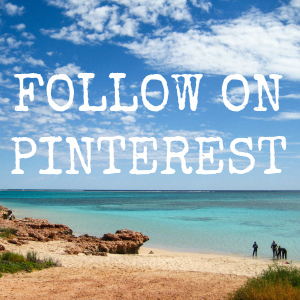 Have you ever fallen so head-over-heels in love with somewhere that it was achingly hard to leave? Oh I love this description of your time in Helsinki! I just left after 5 months and I miss it so much. It’s such a wonderful place. “The thought of leaving was unbearable” completely summarizes my feelings. Hei Shannon! Thank you so much for having the same feelings as me! I ached so much to return for around 6 months. I finally returned two and a bit weeks ago and it’s as amazing and gorgeous as I remembered. I’m not looking forward to leaving again I can tell you! It’s going to be unbearable all over again! Wonderful write-up and beautiful pictures. And yes, I HAVE left somewhere and found it hurt to leave; last summer, leaving Spain. Thanks Elissa! 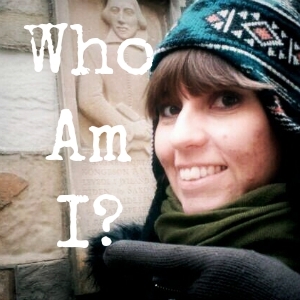 I read your post about Spain – beautifully written, it resonated strongly with me! How wonderful it is to find these places that steal our hearts. 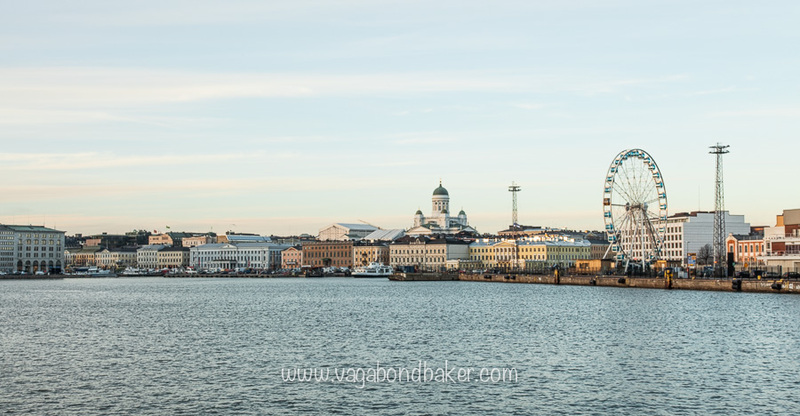 I love this description of Helsinki and your beautiful photos. I’ll be going there in a few months but unfortunatately, just for two nights (I’m in a boutique place which is costing me the earth so 2 nights it is LOL!). Oh wow, I love falling for places! I’ve never been to Berlin or Prague yet but I’m with you with Hong Kong: what an amazing place and very liveable I think. I have a friend who lives there, expat from UK, and he loves it. How lovely, a boutique hotel, sounds a bit more fancy than my dorm bed, but I still wouldn’t change that for anything! 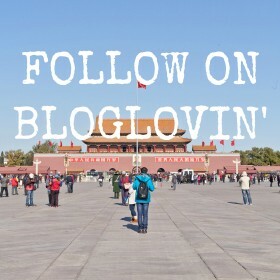 I hope you manage to squeeze a whole heap of sightseeing into those two days. I would certainly say do Suomenlinna, it was definitely a highlight for me and great to get out onto the harbour as well. 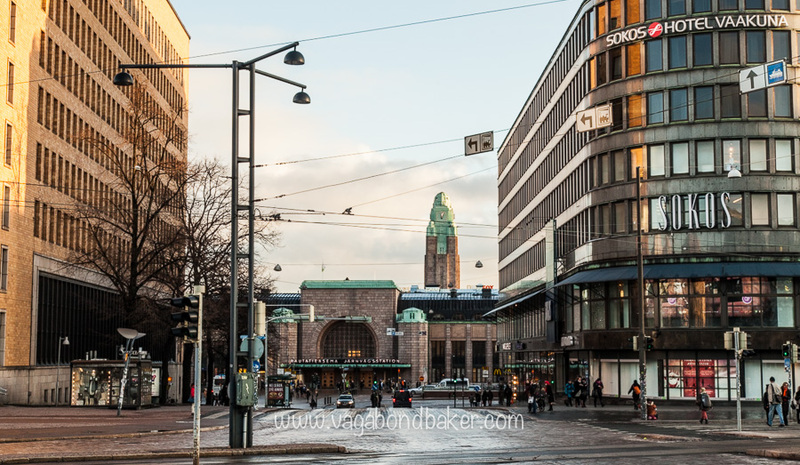 I was just in Helsinki in October (only for a couple of days, unfortunately), but I loved the market halls and the sushi. The salmon was super fresh! Beautiful shot of the plump, little sparrow, by the way. 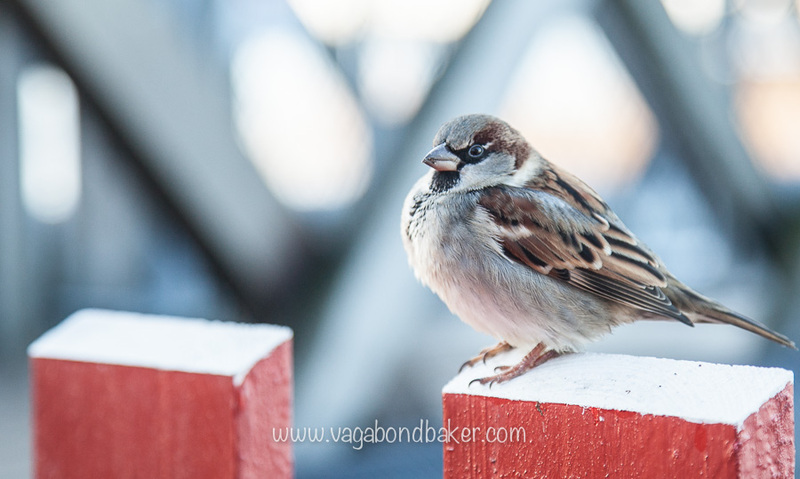 Aw, that little sparrow kept me company as a solo traveller there! Haha, only at the cafe though! I loved the market hall in Turku, I had a quick run around the one in Helsinki but I spent way more time in the one in Turku. I don’t eat fish so all the fresh fish stalls are wasted on me! 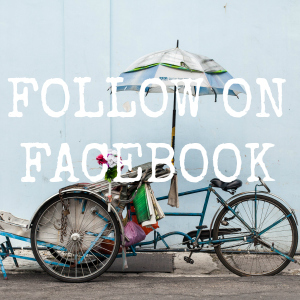 Loved your post Rachel. I felt something similar about Reykjavik and Iceland – something about the people and the place made me feel right at home and I hated leaving.